Solutions Series- Side-by-Side DOUBLE DOOR SUV 36"
Midwest Home for Pets is proud to have and introduce the newest portable Dog Crates. 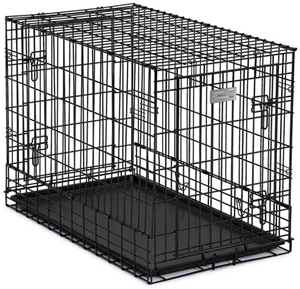 The Solutions Series is the one of most portable and affordable dog crates available in the market today. 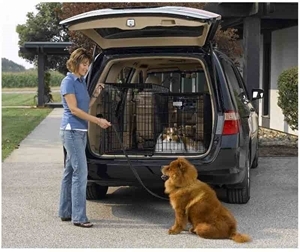 This was designed specifically to fit "side-by-side in SUV’s and van rear compartments. It’s made of durable materials and is easy to clean. Fold and Carry Design as its main feature make it a portable crate. Now upgraded with two doors, one located on each end of the crate makes it very easy instance into the crate from either end. A Suitcase Style; is defined when this dog crate folds in seconds for easy storage. Lastly, it has a safe & secure slide bolt latches for rigidity and comes with a tough and easy to clean ABS Plastic Pan. Solutions Series-Side-By-Side Double Door Black Powdered Coat-36"
Solutions Series- Side-by-Side DOUBLE DOOR SUV 42"